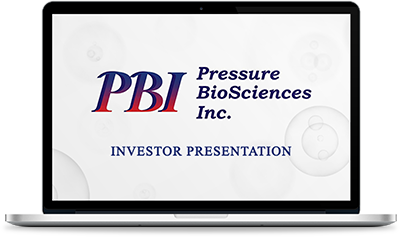 Pressure BioSciences, Inc. (OTCQB: PBIO) is a leader in the development & sale of innovative, enabling, pressure-based platform solutions for the worldwide life sciences industry. 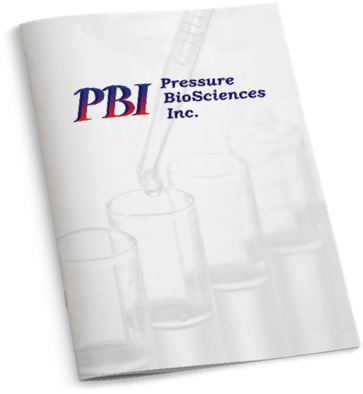 Our products/services are based on three patented, pressure-enhanced platforms: (i) Pressure Cycling Technology ("PCT"), (ii) Pressure Enabled Protein Manufacturing Technology ("PreEMT"), and (iii) Ultra Shear Technology ("UST"). The PCT Platform uses alternating cycles of hydrostatic pressure between ambient and ultra-high levels to safely and reproducibly control bio-molecular interactions (e.g., critical steps performed by hundreds of thousands of scientists worldwide, such as cell lysis and biomolecule extraction). Our primary focus is in making our recently-released, GMP-compliant, next generation PCT-based Barocycler EXTREME instrument available globally to biopharmaceutical drug manufacturers for use in the design, development, characterization and quality control of biotherapeutic drugs. The PCT Platform is also used in such areas as biomarker and target discovery, soil & plant biology, anti-bioterror, and forensics. We currently have over 300 PCT instrument systems placed in more than 200 academic, government, pharmaceutical, and biotech research laboratories worldwide. There are over 120 independent publications highlighting the advantages of using the PCT Platform in scientific research studies, many from worldwide key opinion leaders. The PCT Platform is offered through the Company's Research Products & Services Group. The PreEMT Platform can be used to significantly impact and improve the quality of protein therapeutics. It employs high pressure for the disaggregation and controlled refolding of proteins to their native structures at yields and efficiencies not achievable using existing technologies. The PreEMT Platform has been shown to remove protein aggregates in biotherapeutic drug manufacturing, thereby improving product efficacy and safety for both new-drug entities and biosimilar products. The PreEMT Platform can help companies create novel protein therapeutics, accelerate therapeutic protein development, manufacture follow-on biologics, and enable life-cycle management of protein therapeutics. It is scaleable and practical for standard manufacturing processes. This unique technology platform can help protein-based biopharmaceutical companies create and manufacture high quality, novel protein therapeutics and lower the cost of existing formulations. Research and manufacturing licenses are available. The UST Platform is based on the use of intense shear forces from ultra-high pressure (greater than 20,000 psi) valve discharge. UST has been shown to turn hydrophobic extracts into stable, water-soluble formulations on a small, laboratory scale. The UST Platform offers the potential to produce stable nanoemulsions of oil-like products in water. Such formulations could potentially have enormous success in many markets, including inks, paints, and cosmetics, as well as in pharmaceuticals and nutraceuticals, such as medically important plant oil extracts, i.e., making CBD-enriched plant oil water soluble. We believe that UST has the potential to play a significant role in a number of commercially important areas, including (i) the creation of stable nanoemulsions of otherwise immiscible fluids (e.g., oils and water), and (ii) the preparation of higher quality, homogenized, extended shelf-life or room temperature stable low-acid liquid foods that cannot be effectively preserved using existing non-thermal technologies, e.g., dairy products. The UST Platform is currently being developed for commercialization.